Home > SERVING PIECES > Cereal / Soup Bowls 6"
Polish Pottery Fluted Bowl. 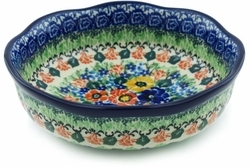 This Polish pottery Cereal / Soup Bowl is beautifully decorated both inside and out. Stoneware dinnerware bowls are versatile pieces that can be used for cereals or soups as well as any other hot or cold meal.As practical as it is pretty, this small fluted bowl makes a stunning addition to any table. Each stoneware bowl is hand painted by talented artisans at famous Ceramika Artystyczna factory. No matter what the occasion, quality handmade pottery is a gift that's sure to be treasured for years to come.